What will you remember about the Queen’s Diamond Jubilee? In a town like Tetbury, so conscious of its royal connections, there will certainly be plenty of celebrations to choose from. But in twenty years’ time what will be your most vivid memories of the occasion? If my experience is anything to go by, they may surprise you. At the time, she celebrated the event in all the ways I thought she should: watched the wedding ceremony live on telly, joined in our local street party, had a non-uniform day at school, went to a party at Brownies. But her fondest memory was none of these things. And there was I fondly hoping that my invention of a Hunt the Corgi game might have been the highlight. I shouldn’t have been so surprised. My own recollections of national celebrations when I was young are equally unexpected. I was a teenager during the Queen’s Silver Jubilee. Though living abroad, I was spending the summer in England staying with my grandmother, and I had my teenage Dutch boyfriend in tow. I remember my grandfather giving us each a Silver Jubilee coin, and there being a lot of silvery stuff and British flags in the shops, but my most vivid memory is of the rivalry with my boyfriend over whose country had the best Queen. To my mind, there could only be one right answer. My faith in Britain’s supremacy was a little shaken when he told me proudly that his forebears had once sailed up the Thames in anger and taken possession of the Isle of Sheppey, something the history lessons at my school in England had singularly failed to mention. By the time the Wimbledon finals came round, our rivalry was intense. 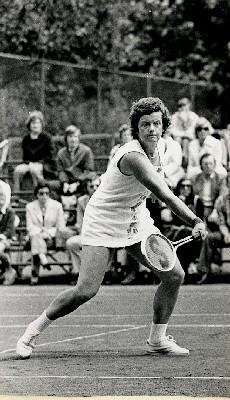 It astonishes me now to have to relate that in 1977, both our nations were represented in the Ladies’ Singles Final: Virginia Wade playing for England and Betty Stove for the Netherlands. To get that far, they had put out in earlier rounds – wait for it – tennis legends Martina Navratilova, Chris Evert and Billie Jean King. It was as if this year’s tournament had been fixed specifically to emphasise the differences between me and my boyfriend. So my strongest memory of the Silver Jubilee is of sitting on the swirly carpet of my grandmother’s living room, tense and shouting alongside my equally vociferous boyfriend, as we watched our nations do battle on the tennis court. I was convinced that Wade would win, as if by some kind of divine right – which was only as it should be in our Queen’s special year of celebrations. And win she did, but only after dropping the first set, to the detriment of my fingernails. 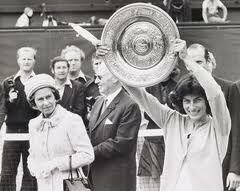 Watching her hold her silver plate above her head was a truly historic moment. Gracious and elated in my victory, I didn’t realise the Dutch boyfriend would soon be history too. However you choose to spend the Jubilee weekend, may it bring you many happy memories. This post was originally written for the Tetbury Advertiser, June 2012. I even have vague memories of the Silver Jubilee as there were some commemorative this-and-thats issued in Canada for the occasion. So the commemorative things worked then, because they made you remember it! Result! I have two memories of the Silver Jubilee:I was expecting at the time and I made two outfits to wear in red,white and blue which I wore on a celebration day with our Methodist chapel (which included pony rides – and no I didn’t – weighing thirteen stone at the time and not being that cruel) and brass band (it being in the North of England). Brass bands always take me back to my childhood.My other memory is stting on a beach in Cornwall that same week and listening to Virginai Wade win the Women’s Fimal. I was bitten by a horse fly on my head and went to an old-fashioned country doctor who berated me for coming on holiday so near the birth,’It’s not due until November,’ I wailed (being prone to outburst of emotion at the time) ‘Then you’d better go home and tell your doctor you’re having twins,’ he said. Back home, at the hospital they laughed;’ You’re just eating too much – cut back,’ they said. Four months later I had twins. By the way, it’s easy to forget that anyone giving birth in those days didn’t have the technology available to modern mums – which must have led to many more surprises! I was very grateful when I had my daughter to know well in advance that she was a girl and even what her date of birth was going to be (I had a Caesarean planned in advance as a medical necessity) We hardly needed to be introduced to each other when she finally arrived! How lovely! And an extra special reason to celebrate the Silver Jubilee! 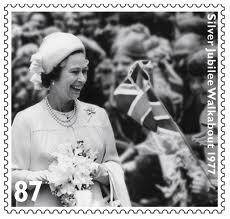 And the Diamond Jubilee too – lucky you! Ah yes, I was 5 in 1977. I had a red, white and blue dress and when the Queen came to Liverpool, I went to wave a flag. I know this because there are photos, but I don’t think I actually remember any of it myself. My daughter’s just turned 6 – I wonder what she will remember fo all this. If anything, I predict it will be the union jack deely boppers. Deely boppers! Weren’t they invented in the 70s? So strangely appropriate! 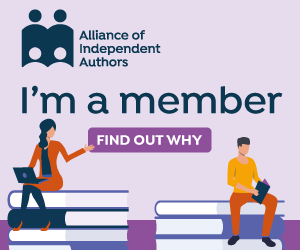 You never quite know what kids will remember – I’m often surprised to find Laura doesn’t remember the things I think she will, but has total recall over other things. I’m really pleased she has just started keeping a diary – she writes loads every night, so today’s entry should be a good souvenir of the Diamond Jubilee!